(6 May 2018 / Palma de Mallorca, Spain) - After four days and nine races, Richard Goransson's INGA FROM SWEDEN has been crowned champion of the first Melges 40 Grand Prix regatta of the 2018 season, an event held in conjunction with Sail Racing PalmaVela hosted by Real Club Nautico de Palma. With Goransson at the helm, Cameron Appleton called tactics, and Harry Melges, Federico Michetti, Oliver Tizzard, Ian Baker, Marco Carpinello, Christian Kamp and Alex Sinclair served as crew members. Making the final race of the event count as a bullet, DYNAMIQ SYNERGY driven by Monaco's Valentin Zavadnikov with Michele Ivaldi as tactician finished second overall. Japan's Yukihiro Ishida aboard SIKON with tactician Manu Weiller came third. The final heat, Race Nine put added pressure on Goransson to do well, as he had successfully defended his position at the top of the standings for three days straight. Appleton took big risks on the last run to the finish, splitting off from the fleet trying to keep INGA in the lead. A third place finish was good enough to keep the crown. "It was very tough, and Michele (Ivaldi) in particular was doing his best to ruin our party, but we believed we could do it in the end," said Appleton. "Richard and the team wanted this win and the time was right. He and the team can finally enjoy the taste of victory in the Melges 40 Class. It's a well deserved result that comes from working hard over the winter, so we could be out in front of everyone." "This boat still has many secrets yet to be revealed, both for us and all the teams that race on the Melges 40 Grand Prix circuit. The learning curve for everyone is still on the rise. Beyond our performance, I am more and more enthusiastic about the Melges 40, which offers up such a great experience in a wide range of conditions." At the foot of the podium in fourth is Alessandro Rombelli's STIG, the most successful team in the Melges 40 Class (with two event wins). 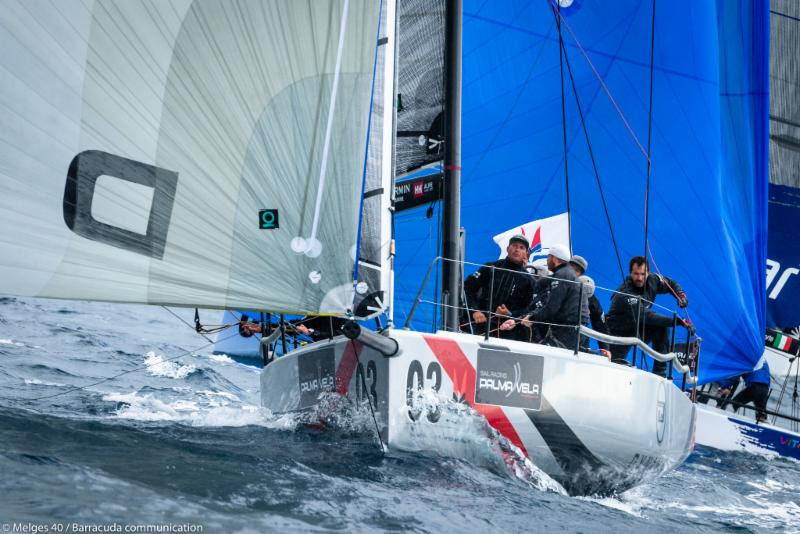 Andrea Lacorte's VITAMINA completes the Sail Racing PalmaVela event in fifth. The Melges 40 Grand Prix moves on to Italy, specifically to Porto Cervo on July 5-8. Teams will take to the regatta field of Yacht Club Costa Smeralda in the One Ocean Melges 40 Grand Prix.